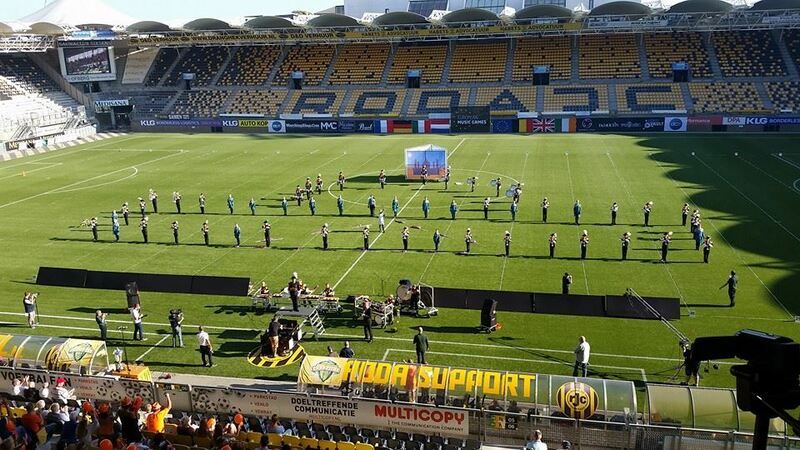 Dordrecht, Netherlands – October 2018… Extreme precision, elaborately choreographed moves, intense physicality, all performed for stadiums filled with thousands. If you think this is a description of football (either the American or the European sport by that name), think again. We are talking about drum and bugle corps. Many don’t realize the level of sophistication that goes into drum and bugle corps performances, let alone their long history and the interest in them that has extended far beyond the shores of the Americas from which modern corps emerged at the end of World War I. 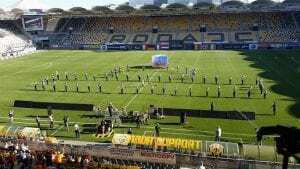 Which brings us to Jubal, a drum and bugle corps operating out of Dordrecht in the Netherlands. Founded in 1911, Jubal started as an all-male, YMCA-like organization that grew to an unwieldy 250 members. In response, Jong Jubal, a youth-oriented corps for boys 8-16 years old, was spun off in 1932. 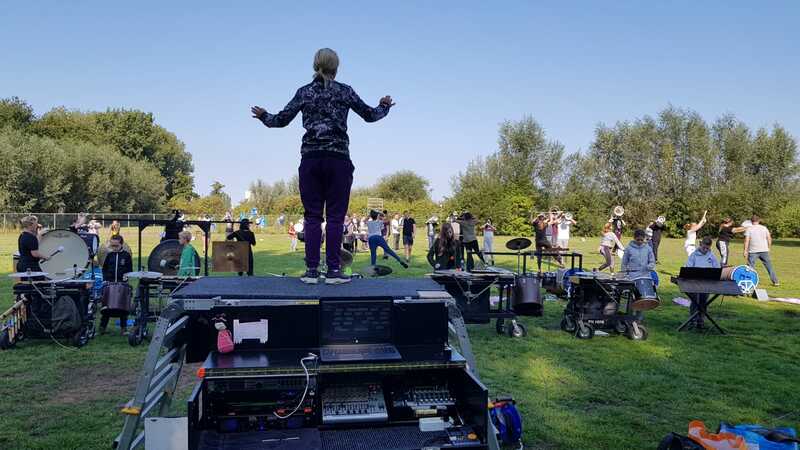 Today, Jong Jubal has around 55 members, almost evenly split between boys and girls, and the corps has won 10 Dutch and nine European drum and bugle corps championships, as well as performing at events in the Netherlands, Belgium, France and Germany. Traditional brass instruments and drums are supplemented in Jong Jubal by a color guard, several instruments too large to march with (such as xylophones and tympani), and, in a modern twist, MIDI controllers playing a large variety of sampled sounds. The digital side of Jong Jubal runs in Deskew Technologies’ Gig Performer software. “The setup we have is unique; I have not seen it elsewhere,” begins program coordinator and brass arranger Ronald Wassink. “Often, you’ll see a single performer playing a keyboard and using a laptop for sounds, but we have the kids playing on Wernick Xylosynth MIDI mallet controllers.” Jong Jubal’s four Xylosynths connect via M-Audio and Steinberg MIDI interfaces to play sounds running in Gig Performer on a Windows laptop. For its current show, Jong Jubal also employs a more traditional MIDI keyboard controller. Inside Gig Performer, Wassink has essentially set up five separate MIDI and audio signal paths, one for each controller “The way we work is different than what people normally do because I have five people playing at the same time, and they have to switch their sounds individually at different moments in a song. So I created a single Gig Performer rackspace with five MIDI In processing blocks, each of which connects to several plugins.” Having a separate module to handle MIDI input from each controller and separate instances of sample playback instruments for each controller output gives Wassink the independence he needs. Five separate signal paths would present a serious processor load in any event, but Jubal is using far more than just a handful of lightweight virtual instruments. Each controller plays an instance of IK Multimedia Miroslav Philharmonik for mallet, tympani, and other orchestral sounds; the Kong Audio Chinee Orchestra library for the authentic Chinese instruments needed for the corps’ current, Asian-themed show, “Sensei”; IK Multimedia SampleTank; and Plogue’s Sforzando SFZ player. The audio outputs from all instruments are routed in Gig Performer to a single stereo pair of interface outputs, where the program sums everything to a stereo mix. Volume controls on the Xylosynths send MIDI volume messages to Gig Performer to balance the instruments. Since instruments like Philharmonik are multichannel, every needed sound is assigned to a different MIDI channel, enabling each player to switch sounds just by changing the Xylosynth’s MIDI transmit channel.